We have all heard the truism “Eat a rainbow for health.” Beyond being a feast for the eyes, every colour brings with it a nutritional strength. By eating a rainbow of foods, you are sure to ingest nature’s finest multi-vitamins. The Big Carrot Natural Food Market boosts the most impressive exclusively organic produce department in Canada. It is so wonderful that customers can shop with such ease and confidence. The issue I have seen in other health food stores is the organic produce is intermingled with conventional and it is sometimes hard to know what you are buying. To learn more about their standards click here. Anti-oxidants are highest in blue and purple foods (blackberries, blueberries, concord grapes, figs, purple cabbage). Beyond the rainbow it is interesting to note that: Vitamin D foods are often white (milk, mushrooms, fish); Vitamin E foods are often brown (wheat germ, almonds, sunflower seeds); Vitamin K foods are often green and found in the Cruciferous family of plants (bok choy, broccoli, brussel sprouts, cabbage, kale, rapini). There is a great deal of “rainbow” crossover with nutrients. A wholesome food will have a spectrum of vitamins A, B and C, and the pigments give a clue to the highest nutrient. 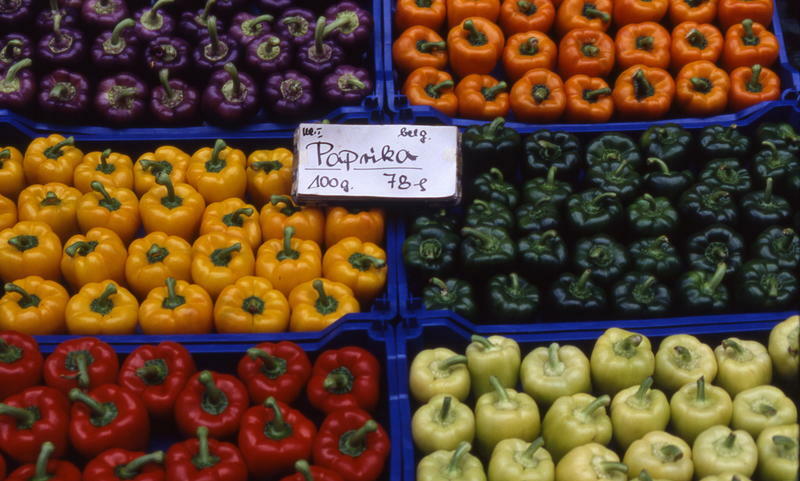 So the colours in fruits and vegetables can help people learn how to fulfill their daily nutrition needs. It makes sense that red is the colour used to express passion. Most of these red foods feed the heart and keep you beautiful as well! Almost all red food contains generous amounts of Vitamin C. Here are some of the ruby stars: raspberries, cranberries, strawberries, red cherries, red grapes, pomegranates, red apples, red plums, rhubarb, red grapefruit, watermelon, guava, tomatoes, red peppers, radishes, radicchio, red onions. The combined effects of vitamin A and C create a great antioxidant capacity, and with lycopene in the mix, the red bell pepper becomes a top notch superfood. Lycopene is what makes tomatoes and peppers red. Red peppers contain high levels of lycopene, which can play a role in the prevention of many cancers. A red pepper contains almost 300 percent of your daily vitamin C intake. Besides being a powerful antioxidant, vitamin C is also needed for the proper absorption of iron. If you are iron deficient, try combining red peppers with your iron source for maximum absorption. One cup of strawberries contains over 100 percent of our daily recommended allowance of vitamin C. Recent studies show that when vitamin C is consumed during times of stress, it actually has the ability to decrease our blood pressure back down to a normal level, preventing the development of hypertension – especially in kids! The orange pigment, beta-carotene, converts to vitamin A, which is important for healing the gastrointestinal tract, lungs and skin. Beta-carotene is part of the carotenoid family, which provides antioxidant protection from the free radicals that can damage cells. One cup of cooked pumpkin contains 146 percent of the daily-recommended intake of beta carotene. This protects cholesterol from oxidation, which in turn assists in the prevention of heart disease. Beta carotene (aka pro-vitamin A) is a powerful antioxidant and anti-inflammatory nutrient. Antioxidants have the power to protect us from cardiovascular disease, wrinkles, and cancer so be sure to consume plenty of these foods: apricot, papaya, orange, pineapple, passion fruit, orange pepper, pumpkin, squash, carrot, cantaloupe, nectarine, peach, sweet potato, mango. Dark green leafy and cruciferous vegetables are among the most potent cancer-preventing foods you could possibly eat. It could be in part because they contain the greatest nutrient density per calorie of any food on the planet. Whether you munch on kale chips or enjoy a watercress salad, you are healing every cell and boosting every organ system. To ensure a long and healthy life, eat more: spinach, arugula, mustard greens, collard greens, broccoli, kale, swiss chard, cucumber, green beans, asparagus, avocado, rocket, spinach, lettuce, watercress, brussels sprouts, sugar snap peas, zucchini. Research into the nutrient density of food has established that the darker the food, the higher the antioxidant level. The purple pigment in fruits and vegetables contains flavonoids, including resveratrol, which can help decrease blood pressure by improving the fluidity of the blood. All fruits and vegetables with a purple hue contain a variety of polyphenols that can reduce the inflammatory response in the body. In my book Meals That Heal Inflammation, I outline the ways in which inflammation is at the root of all major diseases, including heart disease, diabetes, arthritis and immune dysfunction. Purple foods are ulcer fighters. A 2011 study found that anthocyanins from blackberries reduced stomach ulcer formation in test animals. Researchers believe this is because the antioxidants in blackberries prevent oxidation and boost the activity of other important antioxidants, such as glutathione, that are naturally present in the body. For 5 fantastic Rainbow Recipes check more of this article on the Vitality Magazine website or Julie’s Liver Lover’s Salad on this website.